Our kindergarten program is inquiry based; therefore if students show an interest in a specific topic or idea, I then plan my lessons and activities with a focus on their topic. My students have shown an interest on hands-on building and constructing, so we have been doing several STEM (Science, Technology, Engineering and Math) challenges. I cover kindergarten prep, so I see over 100 kids aged 3-6 every day. 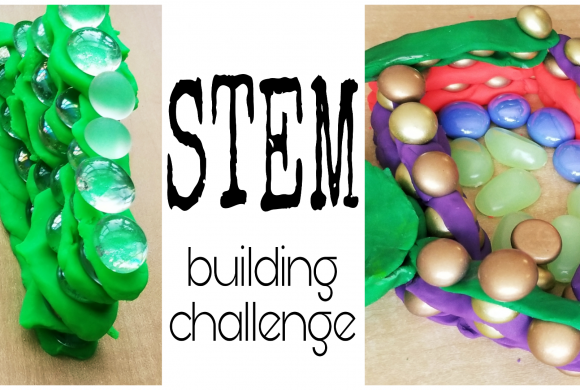 Everyone enjoyed this STEM building challenge and it is so easy to do! I found a bunch of mini building blocks at a local dollar store. 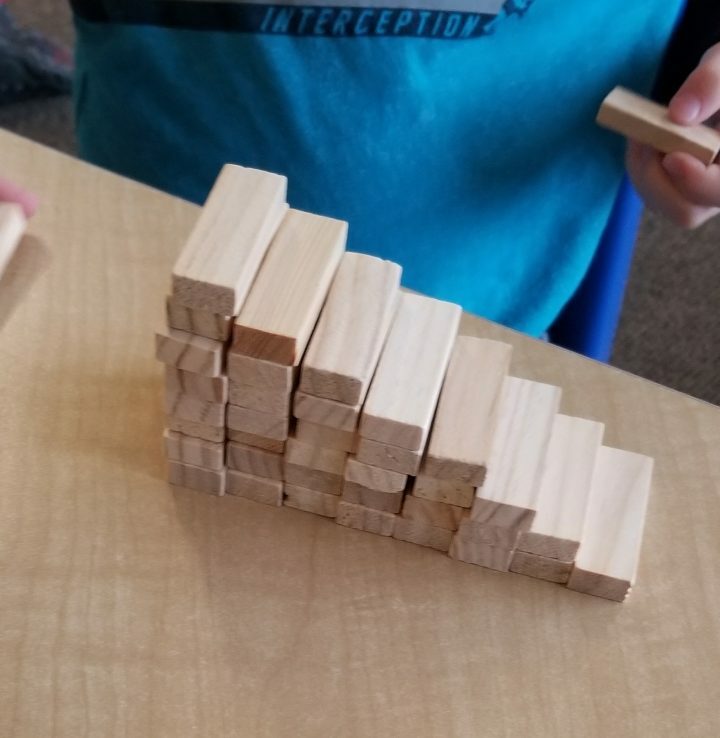 I gave each student one set of the blocks (36 blocks). To start, I gave everyone 5 minutes to build and explore their blocks. I try to do this free exploration any time I introduce new materials because once children have had a chance to play freely with it, they are then more ready to learn and follow directions. 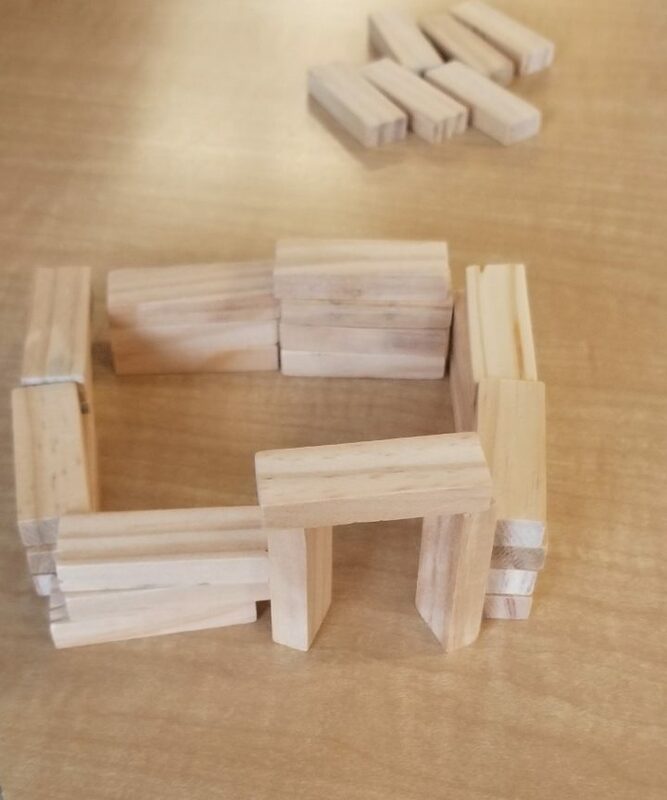 After the 5 minutes, I challenged students to build a house/structure using their blocks. This was a pretty simple place to start, and students created some great homes. 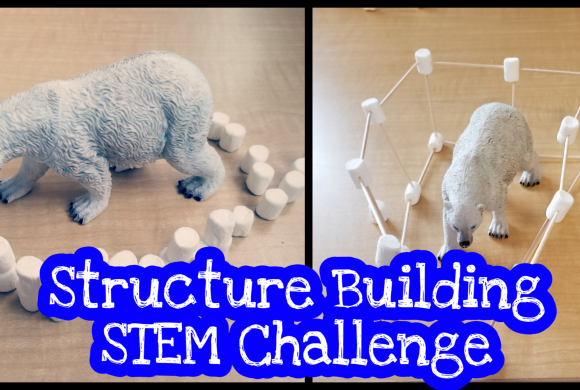 I gave students roughly 5 minutes for each building challenge. The next challenge was my favourite. I asked everyone to create a staircase. At first, some students were discouraged. They could picture a staircase, but not build one. 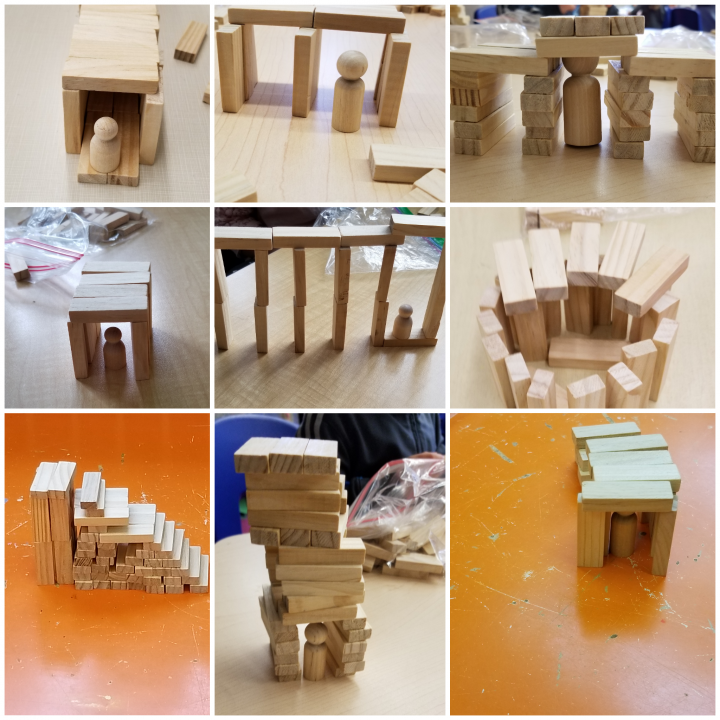 However, once they started putting blocks together and trying different things out, they came up with a variety of staircases. Some were almost flat to the table (shown below) but it still resembled a staircase. I was amazed how I ended up with over 20 different staircase designs – yet with each one you could tell it was a staircase! 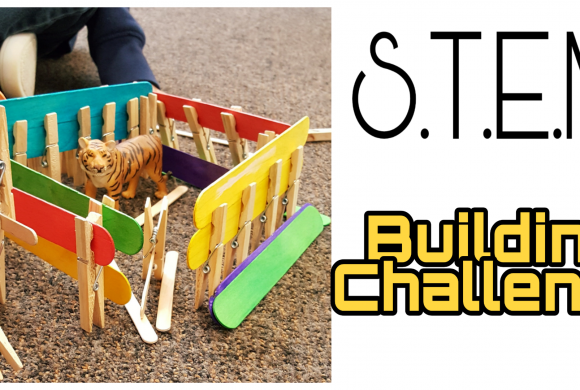 I continued to give different challenges, including building a structure with only 10 blocks, building the tallest structure with all of their blocks, and building a boat. 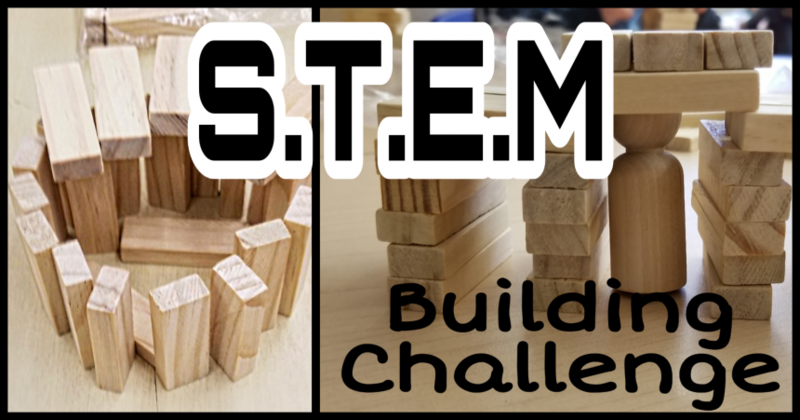 This activity easily filled our 40 minute period, but students were ready to do many more STEM building challenges. 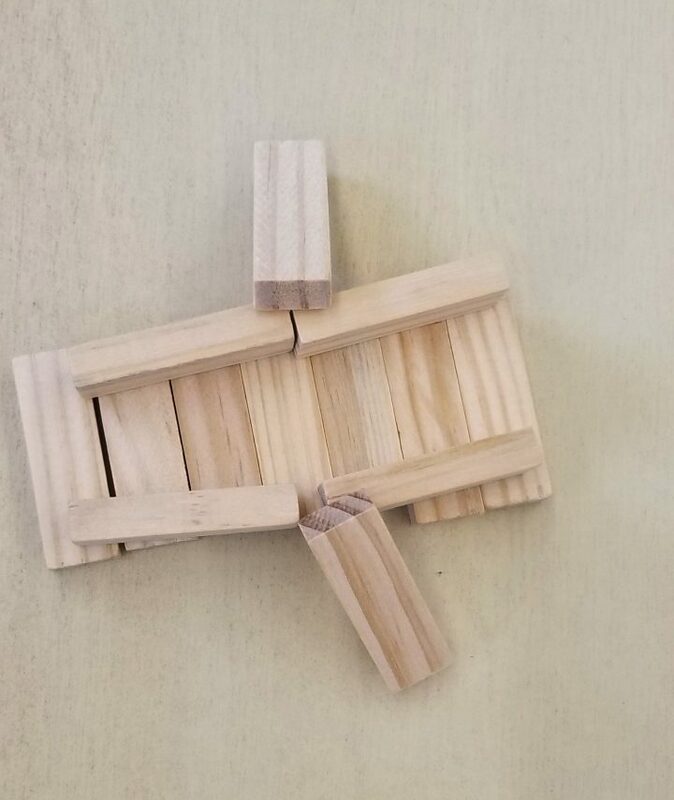 Since students were so eager to build and create with the blocks, the next day I incorporated the blocks into our activity again. I began by reading the popular book “The Three Billy Goats Gruff”. After I finished, I challenged students to build a bridge for the goat. I handed out a bag of blocks to everyone and also gave them a small wooden figure. This was the represent the troll. The only rule was that the troll had to be able to fit under the bridge. Their creations were very impressive! All of the bridges looked different, but they all worked as a bridge for their troll. It was a great learning activity and students really enjoyed building and working to create something.